SUBSIDISED public housing is a privilege and there are 60,000 people in Kuala Lumpur waiting in line for a chance to obtain affordable accommodation. 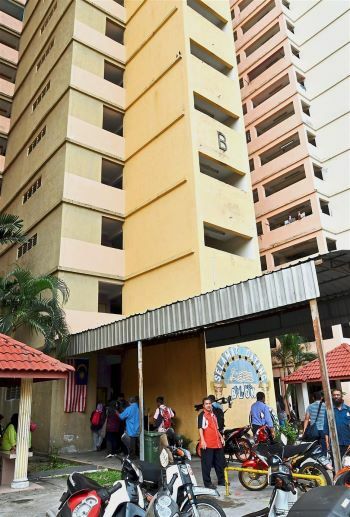 This is why Kuala Lumpur City Hall (DBKL) is intensifying efforts to identify and take action against applicants found misusing people’s housing project (PPR) and public housing (PPA) units. 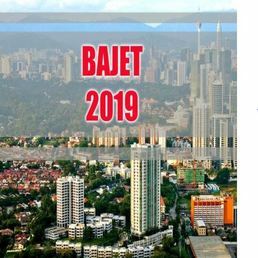 DBKL Socio-Economic Development executive director Datuk Ibrahim Yusoff said they will no longer compromise with offenders who take the PPR and PPA privilege for granted. “The government is offering these units to help those from the lower-income group but there are some who do not appreciate this,” said Ibrahim, adding they aim to weed out all wrong-doers by year-end. “Surveys have been done on suspected offenders since last year and raids will be conducted every week,” he added. Ibrahim singled out tenants who exploit these government assets by renting their units for amounts which are three or four-fold higher. “These offenders prevent other deserving cases from getting a place in PPR and PPA. 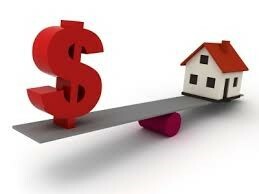 “Some tenants rent the units for RM120 but sublet them for RM500 to RM600. “This is unfair to applicants who have been waiting for up to 15 years for a unit. “Many of them are deserving cases such as squatters or those who lost their homes in a flood or fire,” he told StarMetro during an interview at Menara DBKL 3, Kuala Lumpur. Currently, 60,000 applications have been put on hold due to the lack of PPR and PPA units. Ibrahim said the rental agreements of those found flouting the law will be terminated. Among the stipulations that beneficiaries have to abide by is to not rent their units. Only registered applicants are allowed to stay in them too. Among the common offences are renting the units out, including to foreigners, as well as leaving them empty. Ibrahim said based on current investigations, City Hall expects to seize 40 to 50 units weekly during their ongoing enforcement action. 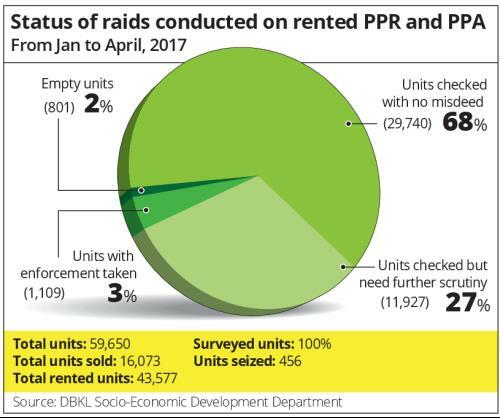 Until the end of April, DBKL had surveyed 43,577 units from 60 PPR and PPA in four zones and 27% need further scrutiny. Ibrahim said one of the reasons proper investigations could not be carried out was due to tenants not being at home. “Officers need to check whether those staying in the units are the legitimate tenants who applied for the flats. “So far this year, we have terminated more than 650 rental agreements and unauthorised tenants constitute the biggest offenders, including foreigners. “Others offences include abandoned units,” he said. 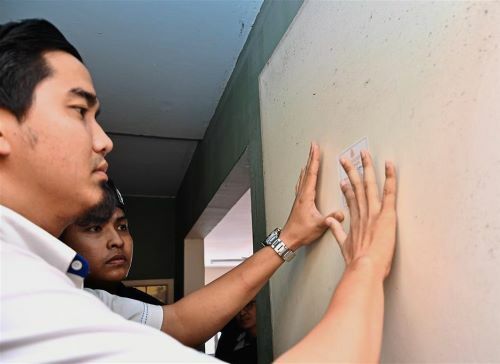 “Some of the seized units are being rented to those on the waiting list and this is ongoing,” said Ibrahim. Repairs to seized units will be borne by DBKL before being rented out. “Most of the repairs involve the replacement of window frames,” Ibrahim revealed. DBKL will ensure all units are occupied as empty lots will lead to additional problems, including attracting drug addicts. Among the challenges DBKL faces is identifying the right applicants and ensuring they do not own any property. 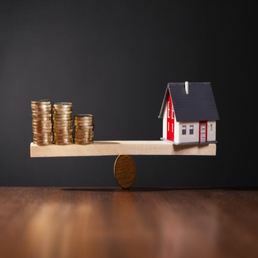 “It is difficult as some applicants may not have outstanding bank loans as they purchased their properties with cash. “We also appoint evaluators to check if the applicants are paying assessment tax and this is a tedious process,” Ibrahim said. He added the ongoing raids are not only to catch offenders but also ensure legitimate tenants are not shortchanged. “We have received complaints from tenants that foreigners are staying in these units. “Their culture and way of life is different and these could pose problems,” he said. DBKL has set up a task force and appointed field officers to coordinate the investigations and raids. “Each officer will work with different DBKL zones and divisions to monitor units that need further scrutiny,” Ibrahim added.